"A potent drink based on the description in the very popular Hitchhiker's Guide to the Galaxy book." 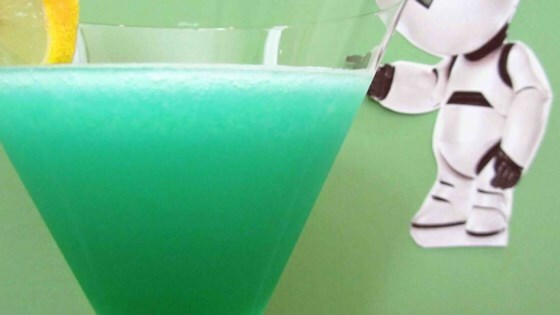 Combine the gin, rum, vodka, tequila, creme de menthe, Galliano and ice in the container of a blender. Cover, and blend until slushy. Pour into a glass and garnish with a slice of lemon. .... and where's that Ole Janx Spirit?... Sorry... having a Doug A moment. Too fun and reminds me of a college roommate who had the Klingon bartending guide. Thanks for making me smile. OMG...I couldn't believe my eyes when I saw this!! Don't Panic! I used more tequila (Patron Silver, yum! ), & it still tasted great! Make sure you have your towel!! This is not an enjoyable drink. The creme de menthe is the dominant flavor but is a weird mint flavor due to the additions. Strong and a bit odd.